Engage your students with science and biology using this illustrated presentation. The first section shows where bats fit into the animal kingdom, it touches on their evolution, how they fly, their nocturnal habits and how they get around in the dark. The second section highlights Irish Bats, their lifecycle and where you might find them in Ireland. 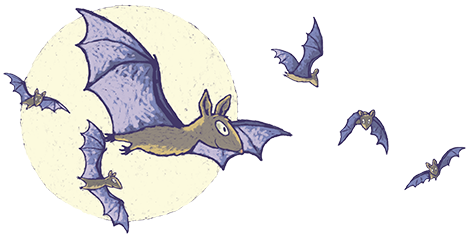 Finally, we discuss some myths about bats – such as whether they will really get caught in people’s hair! To present this lesson bats in your classroom download and read through these notes and feel free to print them out to have to hand while you are talking about the slides.